'1984' by George Orwell - Dystopia or Possible Reality? In the middle of the 20th century, George Orwell frightened the world with the pessimistic forecast he elaborated in 1984. Since this year is far behind us, the novel may seem outdated regarding the threats and challenges we face today. Orwell, inspired by the events in the Cold War, presented a cruel type of totalitarian society, inspired by the Soviet Union under the rule of Stalin. Yet, the ubiquitous character of the Big Brother denies the idea that Orwell's vision was limited to the events he witnessed. Over twenty years after the fall of the Soviet Union, the Big Brother and his philosophy of governance remain a typical example of the protagonists of power in the world. Orwell's predictions for the future, defined by a boot stamping on a human face, were enough to scare both misanthropic pessimists and idealistic optimists. What fraction did the writer belong to? Was he trying to present a gloomy dystopia or a possible reality? Perhaps he did both. 1984 is a dystopian novel in its essence, but to me, Orwell was an impeccable realist. The book is so convincing in the fact that this kind of reality is possible for the future of our society, that the writer had to be deeply convinced in its probability. As a touchstone for our culture, 1984 still is a warning alarm that reminds us how things are about to get worse. We survived the bloodiest century in human history, although we still haven't come to the final nuclear annihilation predicted by Orwell. One reading of this book was enough for me to understand that although this writer was inspired by the Soviet society, his vision can be applied to any government, in any period of history. In the era of globalization and digitalization, the Big Brother seems more realistic than ever before. Even his goals – to enslave the citizens and to keep them frightened and threatened by constant wars, existential crises and continuous brainwashing – are easily applicable in today's governmental systems. However, the means of power have changed. Instead of direct imposition of power, typical for the practices of Lenin and Stalin that served as an inspiration to Orwell, today we recognize the principles of abundance, freedom and democracy. However, these alleged liberties are created in the minds of the subject, serving as means for a more subtle way of governing that has the same Orwellian goals. “War is peace, freedom is slavery, ignorance is strength” – these are the postulates of Orwell's dystopian society. When it comes to the civilization we are witnessing today, it seems like our existence is defined by the final part of this motto, “ignorance is strength”. The need to gradually reduce general knowledge and people's spiritual potential is not exclusive to communist societies. Unfortunately, this hypothesis is an unspoken imperative of higher education programs in contemporary western societies. The system of student evaluation by contemporary educators certainly leads towards their transformation in entertainers. Each lesson that requires more effort is being censored for the sake of simpler methods that appeal to the digital generation. The downfall of arts and humanities in American high schools carries an Orwellian vigor in its essence. The final goal of Orwell's Newspeak was Duckspeak – speech that would be produced solely by the throat, without any participation of the brain centers. When I take a look at the pointless news produced by the numbing mass media, this dreadful prediction seems somewhat familiar. If Orwell could see the turn our society took by following the trail of technological innovation, he would consider his Big Brother to be a rather benign phenomenon when opposed to the outrageous systems for general supervision and the daily attacks on privacy we witness today. Various Internet corporations are monitoring every human in this world without their knowledge or direct permission. They are collecting personal information on our identity. They know all about our habits, connections, prospects, and interests. Monitoring polices are no longer aimed towards politically exposed persons. Today, every citizen is a target. When we see that all countries belong in the territory of global supervision, we realize that democracy is nothing more than an illusion. The information coming from conflicted countries is shamelessly manipulated. When the news reaches us, we are not even able to think for ourselves. Edward Snowden's reports told us what we already knew: the Big Brother is absolutely real. 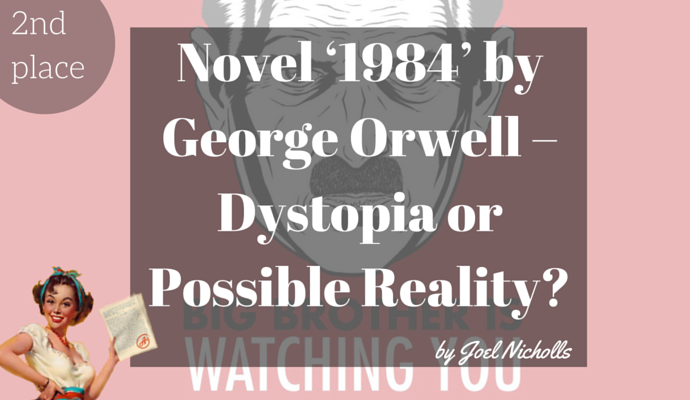 1984 is an unusual blend of the past, present, and future of the human society. It is a credible analysis of power, which can be related to all political ideologies and systems. Power does not choose its means of realization. However, people have an instinct to oppose to things that are being served to them. Winston Smith personifies that natural rebellion that's still present today – some of us do not succumb to mediocrity. In the end, Winston realizes that he loves the Big Brother more than liberty. His transformation represents the end of rebellious spirit and desire for freedom. Winston, who is finally “purified” with the methods of the Party, is a dark prediction for humanity. I choose to believe that Orwell's prediction was unnecessarily pessimistic in this part. Throughout the book, I sympathized with this character and suffered with him. Fortunately, I don't see myself ending up like he did. Many people, who are supposed to be content by the pleasures and convenience served by technology, are refusing to go on the path of mindlessness. If we are living in a world where freedom is slavery and ignorance is strength, I choose to be a fragile seeker for the truth, who is enslaved by the freedom of choice.